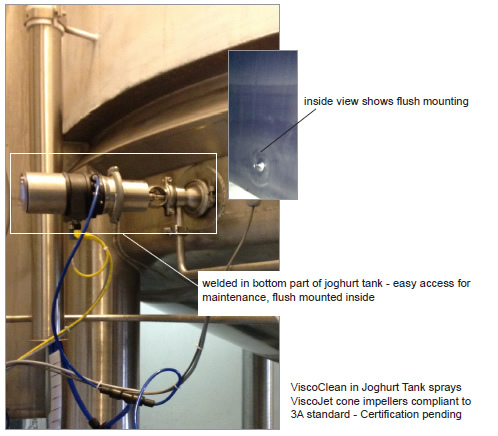 The unique ViscoClean spray nozzle was created to clean the cone-shaped ViscoJet impellers in tanks. The ViscoClean spray device complies with sanitary standards. It is flush-mounted, so that it does not interfere with any process in the tank (no dead zones). The ViscoClean’s innovative design allows you to use it’s static spray nozzle as a unique dosing valve for industries ranging from pharmaceutical to foods. In this application, it provides precise dosing with direct injection on the mixing element in your tank, and delivers the exact amount of additives to the exact right spot. For your convenience, the ViscoClean is available with or without control tops. Our engineers can also provide detailed drawing modifications for you.